January 14 was supposed to be the hanging day in 1884 for the Sioux Crow Dog — but instead of being executed he was busy making caselaw. 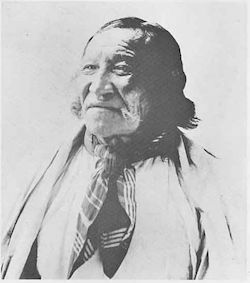 A sub-chief of the Brule Lakota, Crow Dog on August 5, 1881, met — intentionally? — the tribal chief Spotted Tail on a road in the Rosebud Reservation and shot him dead with a rifle. The killing was adjudicated the very next day within the Brule community, at a council where the killer and the survivors of his victim agreed together on the appropriate compensation, and paid up. * But the U.S. Indian agent on the scene also arrested Crow Dog a few days later, and had him tried for murder in a non-Indian court in the the frontier town of Deadwood. Sidney Harring, who would expand this review to book length with Crow Dog’s Murder: American Indian Sovereignty, Tribal Law, and United States Law in the Nineteenth Century, argued in a 1988/1989 paper** that the needless white court’s trial was staged from the outset as a test case by the Bureau of Indian Affairs, angling for new legal tools to break the doctrine of tribal sovereignty which dated back to Worcester v. Georgia (1832). Although that anti-sovereignty cause would suffer a tactical setback in this case, it would very soon carry the day. extended over aliens and strangers; over the members of a community, separated by race, by tradition, by the instincts of a free though savage life, from the authority and power which seeks to impose upon them the restraints of an external and unknown code, and to subject them to the responsibilities of civil conduct, according to rules and penalties of which they could have no previous warning; which judges them by a standard made by others, and not for them, which takes no account of the conditions which should except them from its exactions, and makes no allowance for their inability to understand it. It tries them not by their peers, nor by the customs of their people, nor the law of their land, but by superiors of a different race, according to the law of a social state of which they have an imperfect conception and which is opposed to the traditions of their history, to the habits of their lives, to the strongest prejudices of their savage nature; one which measures the red man’s revenge by the maxims of the white man’s morality. The legal doctrine at work here holds that although conquered, native tribes still possess internal sovereignty. And with Ex parte Crow Dog it became clear and settled American jurisprudence that one attribute of that remaining sovereignty was plenary — that is, absolute — power over purely internal affairs. At least, for a year. This briefest interim between Ex parte Crow Dog and the Major Crimes Act was in a sense the high water mark for tribal sovereignty. Following the Major Crimes bill, white politicians began almost systematically reaching onto the reservations to legislate, picking away at tribal sovereignty until another much more infamous case, Lone Wolf v. Hitchcock, disastrously declared that plenary power now resided in Congress. Crow Dog went on to become a major figure in the ghost dance movement. Present-day American Indian Movement activist Leonard Crow Dog is a descendant; he’s written a book connecting back to his famous ancestor called Crow Dog: Four Generations of Sioux Medicine Men. Meanwhile, South Dakota’s Sinte Gleska University is named for Spotted Tail. * The price was $600, eight horses, and a blanket. ** Sidney Harring in “Crow Dog’s Case: A Chapter in the Legal History of Tribal Sovereignty,” American Indian Law Review, Vol. 14, No. 2 (1988/1989) — also the source of the preceding footnote.